How often do you think about plastic? We’ve produced more plastic in the last 10 years than the CENTURY before that. It has become such a mainstream part of society that we no longer question it. But the plastic problem on our planet is becoming a serious hazard to our oceans, with roughly 8 MILLION metric tons of plastic ending up in the ocean ANNUALLY. If you eat seafood, you are most likely ingesting some of those plastics unknowingly. It’s easy to ignore plastic consumption. After all, it’s recyclable, right? Only 9% of all plastic produced actually gets recycled. When you put something in the recycling bin, the likelihood of it ending up in a landfill is high. That’s because our present recycling practices are inefficient and not economically viable. This is why the United States and many other developed countries shipped their trash to China. However, since China has stopped accepting most of that waste, including plastic recyclables, much of it has ended up in our landfills. Unfortunately, the solution to the plastic problem is not in recycling, which can only work with a really low cost of labor. Many of the single-use plastics that you consume on a daily basis are not recyclable, such as plastic straws, utensils, and plastic bags*. These, along with the recyclable plastic we can’t afford to recycle, end up in landfills. From there, that plastic gets carried into streams by rainwater, which eventually flows into rivers, and finally into the ocean. Recycling makes us believe the perception that we can continue our dependency on disposables. Recycling should be considered a last resort for “disposable” plastics, after reducing, recovering, redesigning, reusing and replacing. Each American generates more than 1,600 pounds of garbage every year. That's more trash per person than any other nation on Earth. Much of it comes from plastic bags, plastic water bottles and plastic packaging. Our love affair with plastic has turned us into a throwaway society, with over 40% of all plastics being single-use, and only 25% of plastic bottles and 5% of plastic bags getting recycled. But awareness is spreading. In 2018, Collins Dictionary named "single-use" their word of the year, citing a four-fold increase in usage since 2013. If you want to pick one type of plastic to go after, it’s single-use plastics. Examples of popular single-use plastics are product packaging, plastic bags, water bottles, beverage containers, utensils, and straws. Packaging makes up 42% of all non-fiber plastic produced and over half of the plastic thrown away. A lot of take-out containers aren’t accepted by recycling facilities, even if they have a recyclable label on them. San Francisco has banned fluorinated take-out containers (along with plastic straws and utensils), giving an incentive for many restaurants to replace them with paper or other compostable materials. Unfortunately, not many cities have followed suit. Plastics bags are especially difficult to recycle. It costs so much more to process the bags than can be earned from selling them, so most of them end up getting sent to the dump. While a few flimsy bags don't seem like much, they add up: Americans consume an estimated 100 BILLION of them every year. These lightweight bags are easily blown away and make their way into the water streams, eventually ending up in the ocean, where they’re confused for jellyfish and eaten by innocent sea turtles. Once ingested, the plastic blocks the digestive system of these animals, and they eventually starve to death. Did you know that even in the United States, a country with potable tap water, one out of every three servings of water comes from a bottle? I lived in NYC and saw a widespread use of plastic bottles in a city that has arguably THE BEST tap water in the country. From friends buying cases of water bottles to keep in their apartment to my office stocking its fridge full of plastic beverages, these single-use plastics were EVERYWHERE. It’s behavior you wouldn’t expect from a city of educated individuals. And what’s worse, a lot of New Yorkers don’t cook (it’s true), and instead order take-out from restaurants, packaged in…you guessed it, PLASTIC. I’m not here to blame these people, especially because I, at one point, was guilty of a lot of these acts. I’m telling you this because I want to shed light on the importance of increased awareness right here in the United States. It’s easy for me to live in California and think that these consequences are widely known, but California is an outlier. Until we get the word out, especially to the younger generations, we will not start to see real change. In the words of Greg Babe, chairman of the American Chemistry Council's Plastics Division, this is not a material problem. It's not a plastics problem. It's a BEHAVIORAL problem. Much of the plastic that ends up in the ocean gets broken down into “microplastics”. These small bits of plastic act as magnets for chemical toxins and are easily ingested by small sea creatures. Many of the fish humans consume have ingested plastic at some point in their life. Most marine organisms can’t distinguish common plastic items from food, and end up passing the toxins from plastics up the food chain. For example, a few pieces of microplastics get eaten by a lantern fish. That lantern fish later gets eaten by a squid. The squid is eaten by a tuna, and that toxic tuna ends up on your plate. 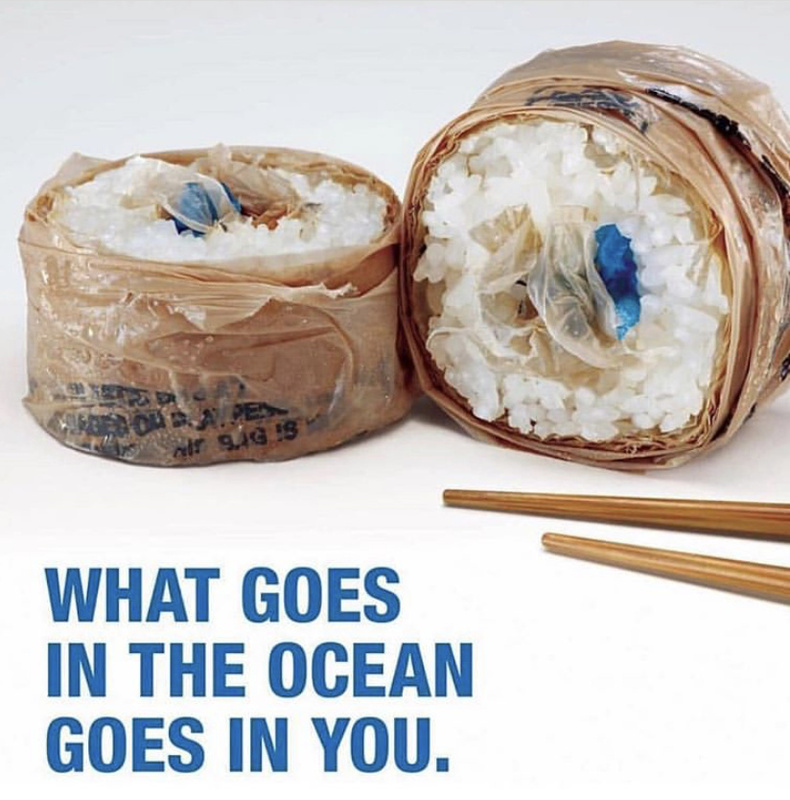 This picture of plastic sushi is obviously an exaggeration, but many of the saltwater fish you eat have some form of highly toxic microplastic in their system. How detrimental is the ingestion of these plastics to our health? Most of us, by now, know about the harmful effects of BPA, but what good is ditching that BPA container when you’re voluntarily consuming it at dinner? If you eat seafood, you are slowly and unknowingly poisoning yourself with toxic chemicals and increasing your risk of cancer, asthma, infertility and developmental disorders. The negative impact to marine life goes far beyond ingesting toxic microplastics. Animals who eat plastic often starve because they can’t digest the plastic and it fills their stomachs, preventing them from eating real food. Birds and other larger animals often become trapped or entangled in plastic bags, fishing line, and other debris. Sea turtles specifically are highly susceptible. They both mistake plastic bags for jellyfish, and frequently get trapped in plastic debris, restricting their growth and movement. Though the declining sea turtle populations in the oceans are due to a variety of factors, plastic pollution plays a significant role. Here are some facts for you: Studies have found that one third of the fish caught in the UK had plastic inside them. Over 40% of all sea birds have ingested plastic at some point in their life. An estimated 98% of albatross have plastic in their stomachs, and 40% of chicks die every year due to plastic consumption. An endangered sperm whale was found washed ashore in Spain last year, dead after swallowing 64 pounds of plastic debris. 31% of cetaceans (whales, dolphins and porpoises) are ingesting plastic debris, and in turn, 22% of them were at an increased risk of death. Scientists have found plastic in the stomachs of animals as deep as 11km (6.8 miles) from the ocean’s surface, showing just how widespread this problem has become. LOVE SNORKELING OR SCUBA DIVING? Do you love to snorkel or scuba dive? Can you imagine how fun those activities will be when half of what you see is plastic, not fish? That’s right. Scientists predict that by 2050, there will be more plastic in the ocean than fish. MORE PLASTIC THAN FISH! Can you imagine what that would be like?? Despite our efforts to increase awareness, the amount of plastic in our ocean is expected to increase TENFOLD in the next two years. If you don’t think this outcome can become reality, you are living in la la land. We currently have five massive patches of plastic floating in our oceans around the globe. The largest, called the Great Pacific Garbage Patch, situated between California and Hawaii, is THREE TIMES the size of France, and growing exponentially. Reduce the amount of plastic you consume by bringing your own cloth shopping bags, coffee mug, and water bottle with you when you leave the house. I’ve even started bringing my own to-go containers to restaurants for leftovers. Opt for reusable products, such as reusable straws, razors, and cloth diapers instead of disposables. Refuse that free plastic bag at the grocery store and that straw at the restaurant. When hosting a gathering, offer compostable cups, plates and utensils to your guests instead of their plastic counterparts (that is, if you can’t use actual dishes, glasses and silverware). Buy products with little plastic packaging, or packaging made from recycled or compostable materials (Did you know all La Femme Boheme packaging is made of 100% recycled, reused, and/or compostable materials?). RECYCLE. Many of us don’t recycle properly, and unfortunately, having good intentions doesn’t change the end result. When you throw unrecyclable items into the recycling bin, that entire batch of recycling is deemed unusable and thrown away. Therefore, contamination can undermine the good recycling habits of others and cause easily recyclable items to end up in landfills. It’s important to research your local recycling guidelines, as not every recycling facility can accept certain plastic products, and only recycle if you are positive that the item is truly recyclable. *There are over 18,000 places in the U.S. to recycle plastic bags, and your curbside recycling bin typically isn’t one of them. Instead, plastic bags and wraps can be taken to recycling bins in front of more than 18,000 U.S. grocery and retail stores. This includes bags for groceries, bread, food storage (ziplocks), cling wrap, and dry cleaning, plus plastic shipping envelopes (remove labels), bubble wrap, and all those annoying shipping pillows that come with your Amazon order. Click here to download a cheat-sheet on what you can and can’t recycle. Print this out and tape it to your recycling bin for easy referral. Stop purchasing products that contain microplastics, such as body/facial scrubs and toothpaste with plastic beads. Start using bamboo toothbrushes instead of plastic toothbrushes. Opt for organic cotton clothing and bedding over polyester when you can. Give up smoking - In 2018, over 2.4 MILLION cigarette butts were collected from beaches on International Coastal Cleanup Day. Use matches or refillable lighters instead of “disposables”. If you are a small business such as myself, please consider the packaging you use for your products and shipping, and try to eliminate plastic as much as possible. Ecoenclose is a great source for eco-friendly shipping supplies. Call your government officials and demand policies geared towards eliminating single-use plastics and providing incentives for producers to develop alternatives to non-biodegradable plastics. Donate: I have included a list of organizations you can donate to directly, or through a purchase of jewelry from my Plastic Ocean collection, available here on Friday, February 1st at 6pm PST (9pm EST). With your help, we can create change and protect this planet that serves as our one and only home for future generations. 2018 was the year of custom orders, and while I loved making personalized pieces for many of you, I would like to make La Femme Boheme about more than just jewelry. Over the years, I have established a very special bond with Mother Nature, and have developed a deep respect for this planet we call home. It has made me more conscious of our impact on the environment and led to both major and minor changes in my life. I would like to align La Femme Boheme's values with my own. So for 2019, my vision is to create collections around environmental issues. Each collection will be designed with an environmental theme in mind, not only to bring awareness to the issue, but also to help the cause. I plan to donate a percentage of the profits to an organization that works directly with each issue. Some ideas I'm considering are deforestation, climate change, water pollution, waste management, animal agriculture, and loss of biodiversity. If you have any issues you'd like to see me feature, please leave a comment below! Also, if you'd like to recommend an organization that works with any of the issues listed above, I’m all ears! Thank you for reading. I hope you are all having a wonderful start to the year and I look forward to making 2019 a year that matters - together.